Democrat Wendy Davis tells a crowd in D.C. that she is “very proud” to be representing Texans in the state Senate. Mona and I were struck by the relationship between the gender pay gap and a state’s political environment. The eight states with the narrowest pay gap voted for President Obama in 2012, as did the District. The six states with the widest pay gap voted for Mitt Romney, often by substantial margins. 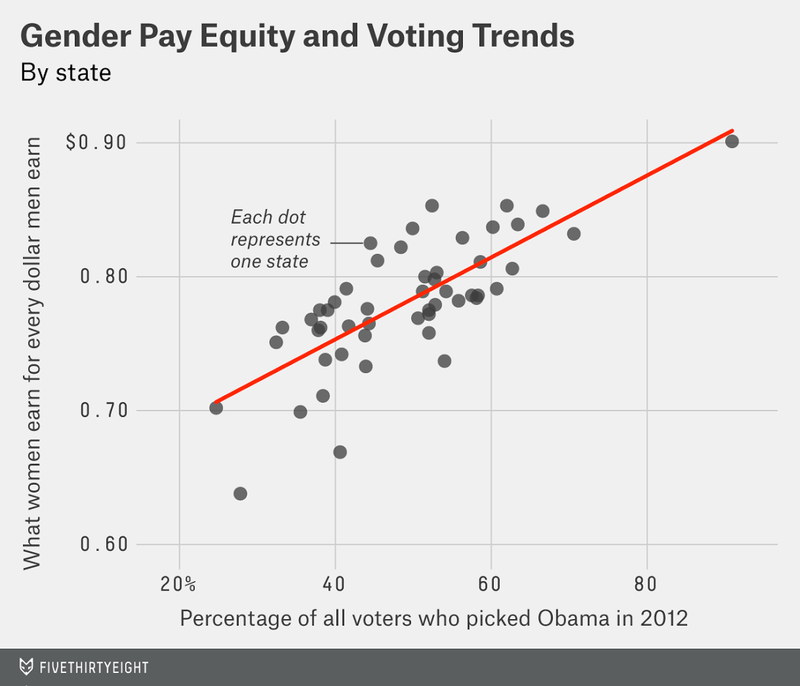 Overall, the correlation between the share of the vote a state gave to Obama and its ratio of female-to-male earnings is .76. For our wonkiest readers: Both variables are statistically significant in a regression where the dependent variable is the gender pay ratio. In other words, they both seem to reveal something about the gender pay gap, independently of one another. It could be that states with more women in political office pass labor laws that are more favorable to female workers (A causes B). 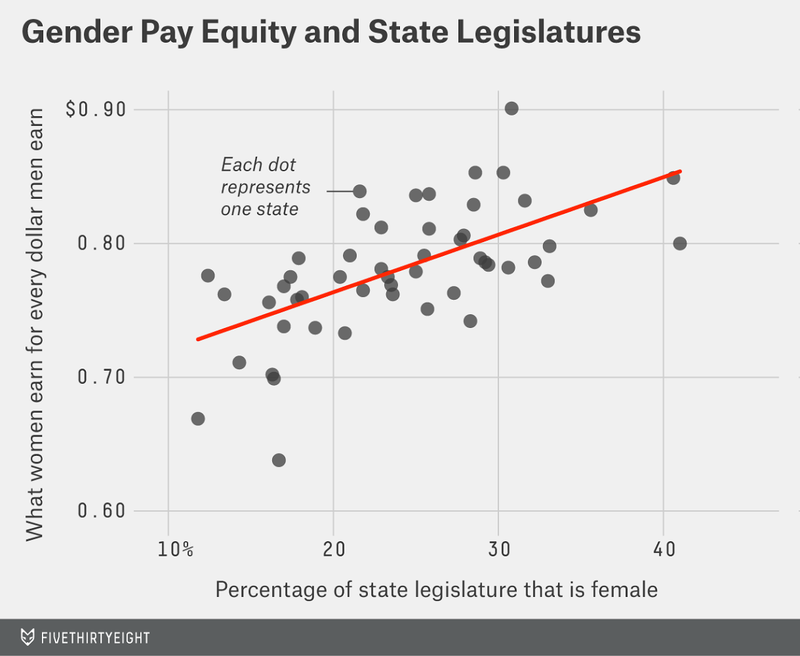 It could be that states where women are earning higher salaries produce a greater number of viable female candidates for political office (B causes A). It could be that both the number of women in office and the salaries earned by female workers reflect the level of discrimination against women or the degree of female empowerment within a state (C causes A and B). It could be that both variables reflect underlying demographic, economic or cultural causes other than discrimination (spurious correlation). The gender pay gap has been the subject of hundreds of academic studies. These studies seek to sort out how much of it has to do with overt or implicit discrimination against women, as opposed to labor force characteristics that are not well accounted for by aggregate statistics. For example, the gender pay gap is narrower when measured by hourly rather than annual wages; that’s because women tend to work fewer hours than men. Men also tend to be concentrated in higher-paying industries. They may have more educational and work experience, and they may have higher-ranking positions within their organizations. None of this is easy to sort out. For instance, it may be that women have lower salaries because they have lower-ranking positions, because they have fewer educational credentials, or because they work fewer hours. But those factors could themselves reflect discrimination. The broad consensus of the literature suggests that while accounting for these factors substantially reduces the gender pay gap, some portion of it remains unexplained and may reflect discrimination instead. That the gender pay gap is correlated with other indicators of women’s status and welfare also suggests that cultural and political factors play some role in determining women’s salaries.